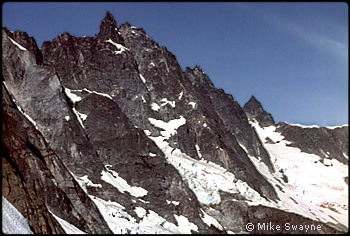 A week after the Wilson Headwall climb, Ed Cooper called asking me to go with him to the Southern Pickets to attempt the first ascent of the North Face of Mount Terror. Dave Hiser and Charles Bell would make up the second rope team. Fred Beckey had tried the approach from Ross Lake and McMillan Creek but had given up. Our plan was to approach via Stetattle Creek through the pass east of McMillan Spire then traverse the McMillan Cirque to the base of the climb. On the afternoon of July 7, 1961, we started up the Stetattle Creek way trail, which had been brushed out by local climber Ken Hunich. Our packs were about 25 lbs. apiece and included two 150-ft ropes, crampons, and about 10 lbs. of hardware. We took dried food for four days and a heavy parka for bivouac. We bivouacked a few miles up the trail that night and fought our way up steep brushy timber and rock outcrops to the Elephant Butte high country the following day. The morning of the third day was clear after a chilly night out. We contoured west with a terrific view of the McMillan Spires. From the pass we dropped over the cornice and began a downward traverse beneath the spires. We traversed beneath the glaciers under Inspiration and Pyramid Peaks, crossing rocky slabs with loose debris and ravines with glacial torrents, and dodging several small ice and rock avalanches. After several hours, we reached what we named “The Barricade.” We found a passage to the top of this obstacle by climbing left of a prominent gully and making a tricky traverse into the upper gully where the left wall steepened. Crossing the Degenhardt Glacier, we had to rappel from an ice piton to cross a deep depression. Eventually, we traversed beneath Terror’s North Face and climbed onto the rock from the right side. We roped up at first, but all the pitches were class 4 or easier so we unroped to save time. Though the afternoon was late and I was tired from the approach, I found myself enjoying every move. I had a terrific feeling of freedom and exhilaration climbing hold after hold on good solid rock, looking down hundreds and then over a thousand feet. I measured our progress against the flanks of Mount Fury to the right and McMillan Spire to the left. I could not have recovered from a false move, but I was oblivious. Dave and Chuck tried following a rib farther left and got stuck. I traversed over to a point directly above Dave and lowered the rope. With a belay he finished the pitch. When he got up, he said that he had been on the verge of losing it. I belayed Chuck up and we traversed back right to easier going. Where the face steepened, we decided to bivouac on a couple of small flat ledges. We settled in as best we could, driving pitons to anchor our gear and ourselves. We ate a little food and waited for the darkness to pass. The night was clear and cold. I was in a sitting position in a little chimney and tried to rest and conserve heat by bending over with my head on my knees, with the parka pulled over my face. I would doze off and then wake with cramps in my stomach and legs. I would move around to get the circulation going again, then repeat the process. As the first rays of sunlight hit the Twin Needles, I got up like a drunk and climbed to the platform where Dave and Chuck spent the night. I did exercises in the limited space to get the circulation going and soaked up the sun like some cold-blooded animal. I now understood why the ancients worshipped the sun. As the sun warmed me, I forgot my earlier stomach cramps and felt like eating again. Ed cussed as he accidentally dropped his Tang over the edge and it fell to the glacier 1500ft below. After a half hour I hardly felt the effects of the bivouac. Ed led the first of four class 4 pitches. The rock was steep but we always found a handhold, wrinkle, or something when needed, so the climbing went very well. Where the ridge leveled off, we unroped and scrambled to a notch below the North Peak. Ed and I climbed several short but very exposed class 5 pitches left of the ridge crest, eventually reaching the crest again at another notch. I could see that the west side would have been much easier so we yelled to Dave and Chuck to cross over if they could. We continued along the narrow serrated crest, with enjoyable climbing hand over hand along the top. Easier terrain led to the north summit. We dropped to a notch below the main summit and scrambled over broken rock to the top. According to the register, ours was the 4th ascent of the peak. We loafed around for about an hour taking in the view and reveling in the experience. All the prominent peaks in the North Cascades could be seen. After a while we began to consider how we were going to get down. We knew an easy route came up a gully from the SW but we had no idea which of the prominent gullies was correct. The first ascent party wrote in the register that they had trouble finding the right one. We decided to rope down the East Face about 500ft to the col between Terror and Mount Degenhardt, which would lead us to the top of The Barrier. This descent proved to be at least as exciting as the climb. We set a two-piton anchor and rappelled over the hugely exposed NE Face. The subsequent rappels had tiny ledges and we had to tie ourselves in. The second rappel jammed and Dave managed to climb back up and grab the free end. We see-sawed the rope and whipped it around to free it from a crack. After four steep rappels and some down-climbing, we reached the col where we could eat, drink, and calm our nerves. We soon learned how The Barrier between Goodell Creek and Terror Creek got its name. Hoping for an easy crossing, we found ourselves standing on a cliff that runs the whole length of the west side of Terror Creek. We decided to stay on top and follow the ridge down as far as we could. We crossed to the east side around 3500ft and spent the night in steep woods, comfortable in spite of the gnats and mosquitoes. My breakfast the next morning was limited to a couple ounces of dry mincemeat pie filling and a couple dried peaches soaked in water. Fortunately, Dave had some Logan bread he shared with the rest of us. We descended toward Terror Creek, rappelling over a drop-off from a vine maple that we tied a sling rope around in a prusik knot. We found an overgrown logging road and hiked out to Newhalem. Since Dave and I were the most presentable, we hitched a ride with a construction worker who took us within 1/2 mile of our car. The brake fluid had drained out of my old 49 Ford, so I had to use low gear and the emergency brake during the drive back to Newhalem. The first thing we did was drive to the commissary and get several bottles of cold pop apiece. This lasted until we picked up the others. They didn't have any money so they had to wait for us to get back before getting anything to drink or eat. After a few rounds at the Log Cabin Inn in Marblemount, we agreed that this climb was one of the best ever. On June 19, 1962, I was down at REI when the clerk said I had a phone call. It was Ed Cooper asking me to go with him to look at the Willis Wall again. During our July 17 climb of Liberty Ridge in 1960, the wall looked terrible, but Ed thought it might be better earlier in the season with cooler weather. I wasn't too excited about the prospects, but said I would go. That night we got our gear together, notified the Mountain Rescue Council (MRC), and headed for the Carbon River. We didn't notify the park rangers, since they had a policy of no climbing on the Willis Wall. Little did they know that this policy had been taking a beating recently. Charles Bell had been on the wall last year and Fred Beckey and Eric Bjornstad had made an attempt earlier this year but retreated after almost being hit by an avalanche. After a night at the Ipsut Creek campground we packed our gear: down parka, bivouac sack, rock and ice pitons, crampons, hard-hat, and concentrated food. We hiked to Moraine Park, where we had an excellent view of the North Face. Then we climbed the Carbon Glacier moraine to 7500ft near our Liberty Ridge bivouac spot. We sat to watch the wall for a couple of hours. Our plan had been to climb the left side but there was too much exposure from rock and icefall from the cliffs above and I thought it too risky. Around 7 p.m. we dropped onto the Carbon Glacier and started up. We climbed to about 200 yards from the bottom of the wall and prepared a bivouac spot behind some ice blocks. It was just getting dark when we heard a roar and a rumble far above. A huge avalanche was billowing down the left side of the wall toward us. We jumped up, grabbed our ice axes and ran toward Curtis Ridge. It took several seconds for the avalanche to descend the wall and rumble out onto the glacier. The light was dim and there was a cloud of ice crystals, so we couldn’t see whether it hit our bivouac site or not. We waited until things quieted down and then went back. The avalanche missed our bivouac but the air was full of ice crystals so we knew it came close. We considered ourselves lucky to be alive, since the slide had run right where we’d thought about climbing. During the night, avalanches disturbed us twice more, a very restless night. By 3 a.m. there had been no avalanches for a couple hours so we headed for the bergschrund below Curtis Ridge. We had given up any ideas of climbing the lower wall and were going to try to reach it higher. We crossed the bergschrund just right of a large rock outcrop then headed on a right diagonal toward a gendarme on Curtis Ridge. After about 1500ft, before reaching the ridge top, we traversed to the right under a cliff and out onto the wall. We climbed around a corner and up a rock pitch, then back to the left to the top of the cliff by the first ice slope. We rested then made a tricky rightward traverse on a steep ice slope to a rocky rib. Since the wall is about 4000ft high and we were in constant danger of ice and rock fall, we decided it was safest to move fast by climbing unroped. I almost lost it at one point on the traverse. I was using an ice hammer in one hand, an ice piton in the other, and the front points of my crampons to keep three-point suspension. A crust of ice overlying rock gave way under my foot as I made a move, and for a moment left me hanging onto the ice hammer and piton. I looked down and quickly recovered my footing. We climbed the rib to the second ice field, which is very prominent on the wall viewed from the bottom. We climbed this second ice field on a right diagonal to below the upper cliffs. We had to dodge rocks that were coming loose and bounding down the slope. 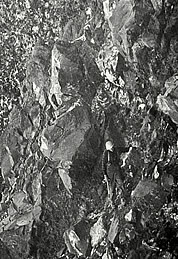 Near the upper right-hand corner of the ice field a steep rotten rock and ice pitch had to be climbed. The rock pitches were tricky as we had to keep our crampons on due to all the ice pitches and ice encrusted rock. Once on top of this pitch, a traverse brought us to the third ice field. This is at the upper tip of the left-hand rib on the wall, and plainly visible from below. From this point we had a good vantage point of the upper part of the wall and could have traversed right out between the two main ribs. We went under the left side of the big ice cliffs on top of the wall and marveled at their size. The climbing from here was over ice slopes and rock bands to the ridge top. From there we could look down on the Russell Cliff route. We rested and started up the slopes to the dome above Russell Cliff. From the dome we dropped slightly then climbed a few hundred feet to the top of Columbia Crest. We reached the summit about 3 p.m. and signed the register. 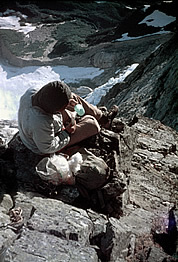 After descending the Emmons Glacier to the Steamboat Prow hut, we rummaged through the emergency food box and ate anything that was edible and drank about two quarts of water apiece. My tongue and the inside of my mouth had swelled up from sucking ice all day. We then stretched out on the bunks to get some sleep. The wind blew steadily all night and although the shelter offered protection, we were cold without sleeping bags. The next day we descended the Interglacier and crossed St. Elmo Pass to the Winthrop Glacier. We traversed to lower Curtis Ridge and descended through Moraine Park to our car at the Ipsut Creek campground. We were due to check in no later than 6 p.m; our call was 10 minutes early. Afterwards, we drove to Seattle and stopped by the P-I, where Ed provided pictures of the climb to reporters. The following Monday a picture of me with Little Tahoma in the background appeared on the front page of the Seattle P-I, with a story about the climb, a first ascent of Willis Wall. Thursday we made the front page of the Seattle Times. Apparently, we had damaged the authority of the Park Superintendent because our failure to ask his permission did not allow him to say no. The TV, radio and newspapers reported that the authorities would throw the book at us. Climbing mountains changed my life for the better, even though it was hard on others and me at times. It changed how I approached projects and related to coworkers. It influenced me to find my niche as an independent consultant. My climbing must have worried my parents, although I did not tell them about the narrow escapes. Climbing must have been especially hard on my friend and eventual wife Lillie, fearing that one day I might not be coming back from some climb. Eventually I rearranged my priorities to put my family first and I slowly became more or less “normal” again, although it took many years. I believe that our six kids, Elizabeth, Michael, Donald, David, Eva and Amy, benefited greatly from our mountain trips to camp, fish, hunt and ski. My three sons made many recreational and wilderness climbs with me, but I never encouraged them to climb seriously. Losing one of them would be too much to bear.